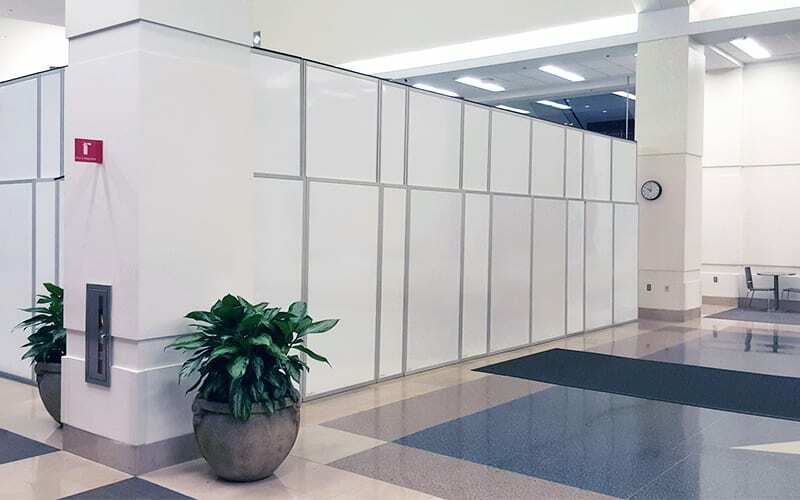 STARC’s modular reusable temporary wall panels provide an ideal solution, across a number of commercial applications like Class A office space, data centers, education, and airports, where the ability to isolate renovation from sensitive occupied areas is desired. This allows employees, customers, and visitors to continue their work without disruption. The STARC panels look like a real wall and blend into the existing environment. They have a foam core that eliminates up to 50% of renovation noise. Because they are reusable and quick and easy to install; two people can install 100’ of wall in one hour, you save on labor and material costs. They are the most durable temporary containment solution and can be used on hundreds of jobs and are backed by an industry leading 3-year warranty. STARC eliminates the disruption of renovation. Installation won’t bother employees or customers and the real wall looking, sound-attenuating panels allows business to go on as usual during construction. Make smaller spaces out of larger ones, or partition off renovation work. Keep critical systems clear of dust and debris. Easily reconfigurable as server requirements change. Create spaces that comply with ICRA Class IV protocols and maintain negative pressure. Ensure that guests don’t become irritated by dust, noise, or the construction team. Hide renovations from passengers with sturdy panels that look like real walls.